I’m super excited to combine some of my favorite things in this post: ice cream, Gail Gibbons, Virtual Book Club and literacy activities! Yes, this month’s featured author is Gail Gibbons. We chose to focus on her book, Ice Cream: The Full Scoop. 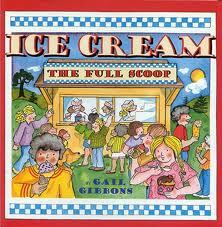 I featured Gail Gibbons before as one of my favorite non-fiction writers for children. If you missed that post, head here to learn about all of my favorite Gibbon’s books. She does such a wonderful job of illustrating her books and loading them with lots of fun and useful facts. Ice Cream: The Full Scoop covers the history of ice cream, how it is made, all the different flavors and how it is sold. I really like that this book can be enjoyed by all ages. Younger children will enjoy going on a picture walk of the book while older children will enjoy all the fact nuggets and detailed diagrams. One box of colored ice creams = fun literacy games! After reading Ice Cream: The Full Scoop, enjoy a few games to help develop literacy skills. Encourage the younger crowd to create patterns with the cones. Noticing patterns is a crucial skill for spelling. It’s never too early to help children discover patterns. Kids will also be developing left to right tracking when creating their patterns. This is an essential skill in reading. Do you remember the game where you place an object under a cup and then someone mixes the cups around and you have to figure out which cup has the hidden object underneath it? This ice cream cone mix-up is a take on that game. You’ll need three cones and three milk/juice caps for each round of the game. On each cap write a word that your child is learning to read or a vocabulary word. 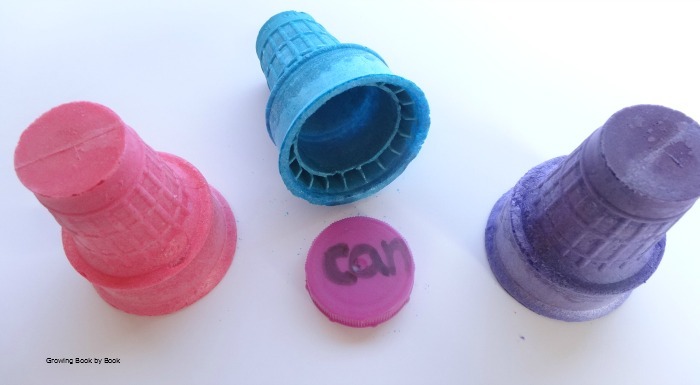 Place a cap under each cone. Slide the cones around to mix them up. Call out a word and have the child select a cone to see if the correct word is underneath the cone. When they find the correct word, have them spell it or use it in a creative sentence. 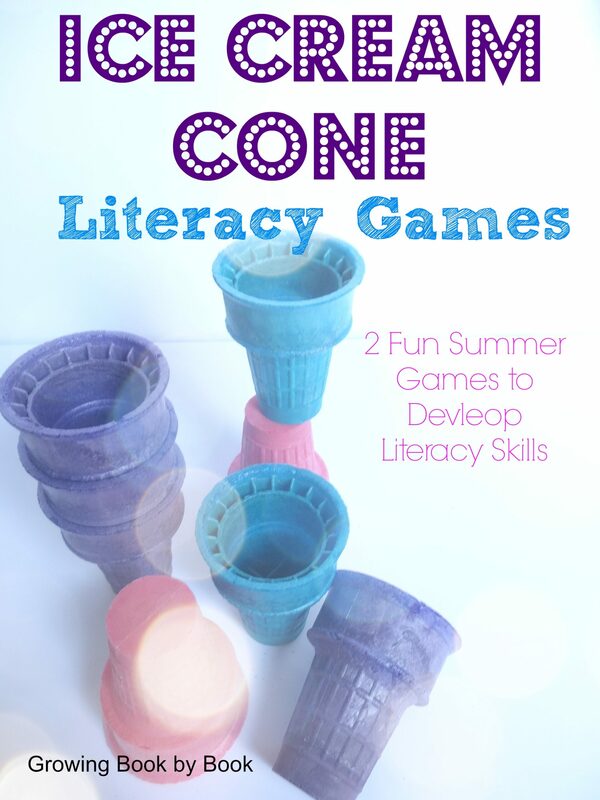 Can you think of other ways to use ice cream cones to build literacy skills? I’d love to hear your ideas. After you are done playing games with the cones, I’m sure you will find another yummy activity to enjoy! P.S- I try not to feed my boys artificial coloring so we chose to smash up the cones and use them in a sensory bin instead! Looking for more creative summer literacy ideas? Check out the Alphabet Summer Fun project we are doing this year. Don’t forget to subscribe to our RSS Feed so that you don’t miss any posts! You can also like us on Facebook or follow us on Pinterest. Now it’s time to see what Gail Gibbon’s books other great bloggers in the Virtual Book Club chose to feature. Enjoy browsing. And, if you have a Gail Gibbon’s activity, please link up. What fun games AND such cool ice cream cone colors. Where did you find them? Kristina, I don’t have the box anymore to tell you the brand. My local grocery store carried them though. Next time I’m at the store, I’ll check out the brand name. I remember they came in a red box with blue writing. I am so in love with your website! I am also in love with Gail Gibbons. Thanks for the great post on muffin tin literacy games, too. So excited to explore your site more! Ruth, thank you so much for your kind words. I hope you find lots of treasures!